In this authentic possession with private pool, garden, jacuzzi and sauna in Felanitx you will find plenty of space for quiet holidays. It can accommodate from 16 to 18 people. Welcome to this country house for 10-12 people located in Felanitx. It counts with swimming pool. All in all it is the perfect place for enjoying the peace of Majorcan rural areas. This wonderful house is located in a quiet region near Felanitx and can accommodate 6 to 7 guests. This spectacular property lies in the south east of Mallorca, in Felanitx and welcomes 10 people. We welcome you to this house located in a mountain environment. It is a house with capacity for 4 people, equipped with swimming pool, where you can enjoy the tranquillity. 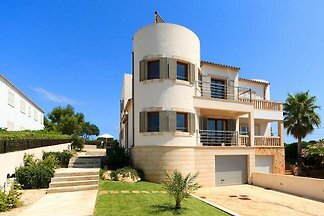 Located in Porto Colom in the eastern part of Mallorca this modern house invites 6 guests. This beautiful cottage in Felanitx features a private pool and can comfortably accommodate 11 people. Welcome to this house with private pool in the countryside for 5 people. It is the perfect place for those who look for a quiet vacation. Great finca near Felanitx where 8 people will find a rustic house and a great garden with private pool. 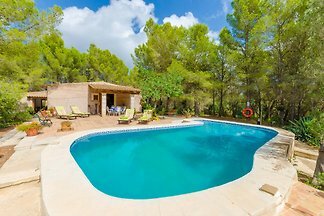 This charming cottage with private pool rests in a tranquil spot near Felanitx, in the south-east of Mallorca and can comfortably accommodate 6 guests. Beautiful finca with private pool, located in a rural area of Felanitx where up to 6 people will spend an unforgettable vacation in its dream-like garden. Welcome to this luxurious villa for 12+1 people located in Vall d'Or Golf, in Portocolom. Set in Felanitx in the Southeast of Majorca, this coquettish villa features a private pool and a garden. It can comfortably accommodate 6 - 7 guests. Deluxe - beach Villa Porto Colom 3282 with private, fenced pool and sea view on the beach (125 m). 3 bedrooms, 3 bathrooms, internet, dishwasher, washing machine and air conditioning. Welcome to this magnificent villa of 220 m2 located in a rural environment near Felanitx, which sleeps up to 9 people. Welcome to this wonderful traditional Majorcan house from the eighteenth century that counts with a swimming pool. The accommodation, with 280 m2 is located in a plot of 360. Welcome to this great house with private pool located on the outskirts of Felantix with capacity for 12 people. Welcome to this spectacular villa located among the fields of Felanitx, with two buildings and a beautiful garden and a great chlorine pool. from 5 1 holiday homes & accommodations in Felanitx were rated with an average of 4 out of 5 stars ! Rent successfully your holiday flat or holiday home in Felanitx in only 20 minutes !